We should describe the vibe at Tashidelek Guest House as an essentially "hippy" one. 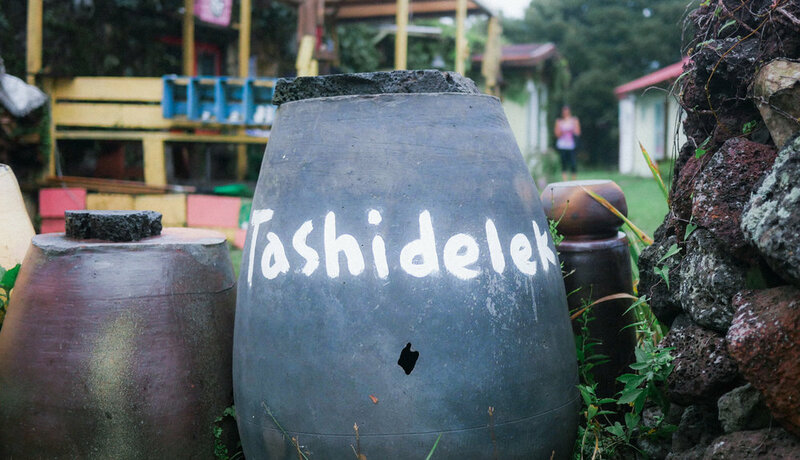 The word conjures up a variety of impressions, depending on who you are using it with, but it's the best one we have to impart the essence of what is taking place at Tashidelek Guest House on Jeju Island in South Korea. Tashidelek Guest House isn't the kind of place we would expect to find in a country like South Korea. It stands out as culturally unique. We were greeted by multiple resident dogs, a colorful atmosphere, hammocks, and friendly hosts. 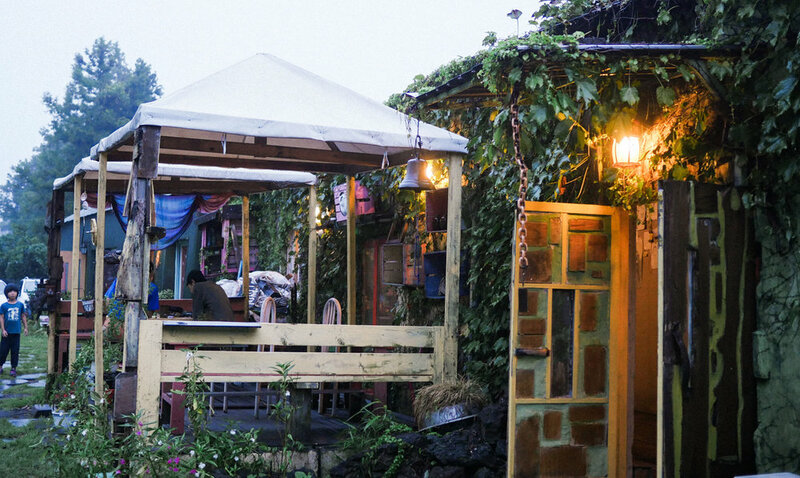 The house is located on the far southern part of the island, only about an hour or so away from downtown Jeju. 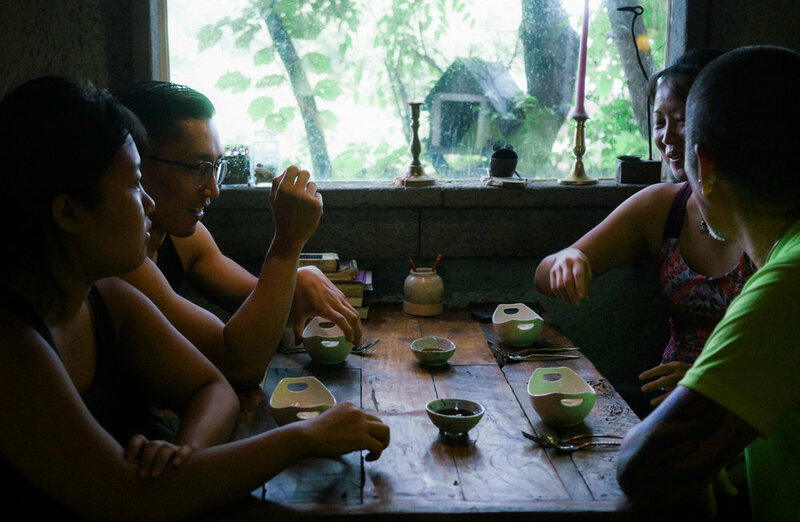 Tashidelek is isolated, providing visitors with a peace and quiet that is often hard to find—especially in busy countries like South Korea. We enjoyed breakfasts of freshly made naan, homemade yogurt, and fresh bowls of salad—hard to find items in South Korea. We began class with some bond-building singing. This is common for Acroyoga immersions and workshops as it seems to put us all in the right frame of mind for an activity that requires compassion, communication, and collaboration. Together we sang a song called "The Ocean Is The Beginning of The Earth." It's a beautiful song, and we enjoyed singing it very much. After we warmed our voices and our hearts, we dove into our first class. We spent about three hours observing teacher demonstrations, learning specific Acroyoga techniques, and practicing therapeutic Acroyoga "flying" and "basing" with our new friends. For lunch, we split into groups to explore the area around us in search of local fare. After a nice long, wandering walk, we found a traditional Korean restaurant that looked nice. With few vegetarian options, we ordered what was on the menu—fish and pork. In true Korean fashion, our meals arrived with plenty of side dishes, all with free refills. We began our afternoon session learning a Supine Thai Massage sequence. About 40 minutes was spent as a giver (of massage) and about another 40 minutes—in true bliss—as a receiver. Afterward, we began our second session, of therapeutic Acroyoga flying. In this session we focused on "back flying." This is a technique in which "flyers" (the person on top) is on their back, facing downward. The session ended with a gentle massage circle. For dinner, we desperately searched for veggies, finding Tony Tony Guest House where we ordered an amazing looking salad. Fresh, light, meatless, and exactly what we needed.